With long serrated knife, cut bread in half horizontally. Spread cut side of each bread bottom with half of the spreadable cheese. Overlapping slices, arrange remaining ingredients except pesto in order listed over each bread bottom. Spread cut side of each bread top with half of the pesto, and place over arugula. Place each whole loaf in large food-storage plastic bag; seal and refrigerate topped with cast-iron skillet or other heavy weight up to 24 hours. When ready to serve, cut each loaf into 6 equal sandwiches. Secure sandwiches with toothpicks or small skewers. 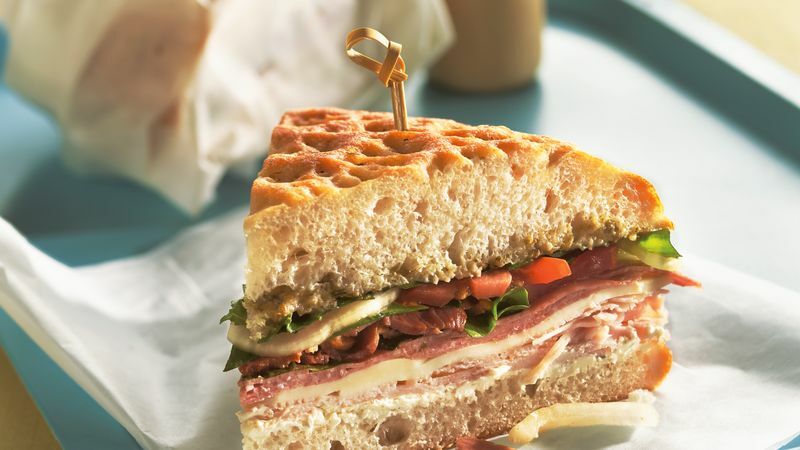 Tailor-make this sandwich to suit personal tastes. Replace the tomato slices with sun-dried tomatoes or roasted red pepper strips. The salami can be replaced with pepperoni. If no heavy item is available to weigh down the loaf, wrap the sandwich very tightly in plastic wrap.